NEW YORK -- He does the "Monster Mash" no more. Bobby "Boris" Pickett, whose dead-on Boris Karloff impression propelled the Halloween anthem to the top of the charts in 1962, making him one of pop music's most enduring one-hit wonders, has died of leukemia. He was 69. The hit single ensured Pickett's place in the pantheon of pop music obscurities, said syndicated radio host Dr. Demento, whose long-running program celebrates offbeat tunes. "It's certainly the biggest Halloween song of all time," said Demento. The DJ, who interviewed Pickett last year, said he maintained a sense of humor about his singular success: "As he loved to say at oldies shows, `And now I'm going to do a medley of my hit.'" Pickett's impression of Karloff (who despite his name was an Englishman, born William Henry Pratt) was forged in Somerville, Mass., where the boy watched horror films in a theater managed by his father. Pickett used the impersonation in a nightclub act and when performing with his band the Cordials. 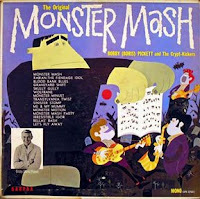 A bandmate convinced Pickett they needed to do a song to showcase the Karloff voice, and "Monster Mash" was born _ "written in about a half-hour," said Dr. Demento. The recording, done in a couple of hours, featured a then-unknown piano player named Leon Russell and a backing band christened The Crypt-Kickers. It was rejected by four major labels before Gary Paxton, lead singer on the Hollywood Argyles' novelty hit "Alley Oop," released "Monster Mash" on his own label. The instant smash became a sort-of Christmas carol for the pumpkin and ghoul set. In a 1996 interview with People magazine, Pickett said he never grew tired of it: "When I hear it, I hear a cash register ringing." While Pickett never re-created its success, his "Monster's Holiday," a Christmas follow-up, reached No. 30 in December 1962. And "Graduation Day" hit No. 80 in June 1963. He continued performing through his final gig in November. He remained in demand for Halloween performances, including a memorable 1973 show where his bus broke down outside Frankenstein, MO. Beside his daughter and sister, Pickett is survived by two grandchildren. 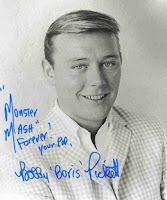 Bobby "Boris" Pickett was a huge inspiration and will be missed.